The Harvard Sailing Center sinks into the Charles River on Friday. Diving crews worked over the weekend to temporarily “restore” the Harvard Sailing Center, which began sinking into the Charles River last week in the wake of a strong nor’easter. The sailing center, located in the heart of Boston between the Longfellow and Massachusetts Ave. bridges, houses the College's varsity sailing team boats. At the lowest point of its sink across the past few days, the building dipped roughly six feet into the water. 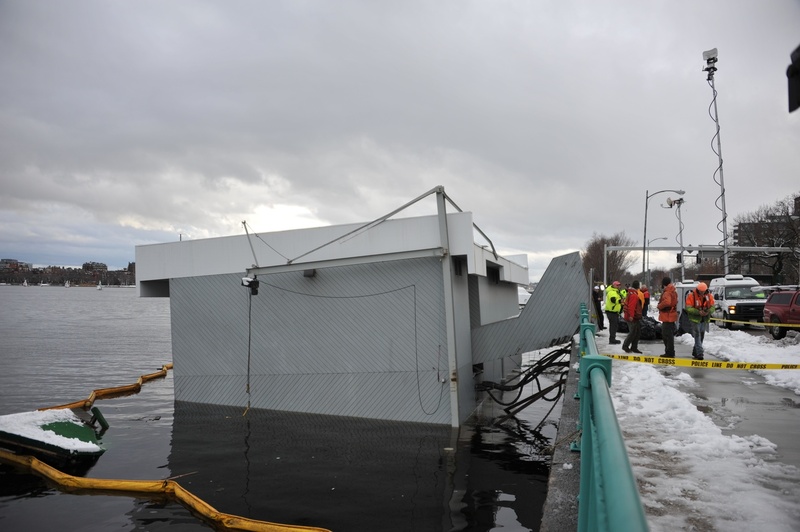 Athletics Director Robert L. Scalise wrote in a press release Thursday that the sailing center began sinking into the river due to a flotation device failure. In days since, though, University officials have said they are uncertain about the official cause. Workers from Semper Diving and Marine, a commercial dive company specializing in marine construction and inspection, started trying to pump and raise the facility as early as Friday, according to the Boston Globe. These attempts were ultimately successful, according to University representative Aaron M. Goldman. "Crews from Semper Diving and Marine were hard at work throughout the weekend and were successful in temporarily restoring the condition of the Sailing Center, to stem any further damage to the structure,” Goldman wrote in an emailed statement Monday. Workers from Clean Harbors—which offers environmental, energy, and industrial services including waste disposal—were also on site to help repair the building over the weekend. Clean Harbors Vice President David Proud confirmed that the company “was called in” by Harvard. “We set [a] containment boom around the structure to contain any floating material,” he wrote in an email Monday. Goldman wrote the next step is to ensure the repairs are permanent. “In the coming days, crews will work to make these repairs permanent and we will share further updates as they become available,” he wrote. Scalise and Assistant Director of Athletics Daniel J. O’Brien did not respond to requests for comment. The Harvard-Radcliffe Dramatic Club’s production of "Dogfight" perfectly captures the whirlwind of passion its young characters experience. The production fluidly shifts from lighthearted song-and-dance numbers to moving moments of quiet and sadness. Moreover, the actors infuse an occasionally clichéd storyline with life and emotion through effective singing and acting.